[Andreas Bastian] has been working on a device that turns an off-the-shelf laser cutter into something capable of selective laser sintering of powdered plastics into 3D objects. He’s put in a lot of work, but now he gets to see the fruits of his labor: he’s successfully printed a few objects out of wax and powdered nylon. Unlike just about every other inexpensive 3D printer, [Andreas]’ design doesn’t rely on either squirting plastic onto a bed or curing liquid resin with UV light. Instead, a fine layer of powder is spread over a build platform and melted with a laser. The melted layer drops down, another layer of powder is applied, and the cycle repeats until the part is finished. It’s a challenge to build one of these machines, but [Andreas] had the great idea of retrofitting an off-the-shelf laser cutter, allowing him to focus on the difficult task of designing the powder and piston system. It’s an extremely interesting project, and most of the custom parts are made from laser cut acrylic: easily cut to size on whatever laser cutter you’re retrofitting with 3D printing capability. There’s a lot of info over on the Wiki, and a few videos showing the sintering process and powder distribution below. Oh. One last note. [Andreas] developed this while at [Jordan Miller]’s amazing lab at Rice University. There’s a lot of interesting things happening at this Advanced Manufacturing Research Institute, including bioprinting, DLP resin printers, and using inkjets for cell cultures. Check out this post for a great talk at the Midwest RepRap Festival. In case you haven’t heard, NASA is building a new rocket – a replacement for the shuttle – that will eventually take crews again outside low Earth orbit. It’s called the Space Launch System and looks surprisingly similar to the Saturn V that took men to the moon. Manufacturing technology is light years ahead of what it was in the mid-60s, and this time around NASA is printing some rocket parts with selective laser melting. Teams at the Marshall Space Flight center are melting metal powder together with lasers to produce parts for the new J-2X engine intended for use in the earth departure stage of the Space Launch System. While the 3d-printed parts haven’t seen a use in any live fire tests of the J-2X, the goal is to test these parts out later in the year and eventually have them man-rated, to carry astronauts to the moon, asteroids, or even Mars. 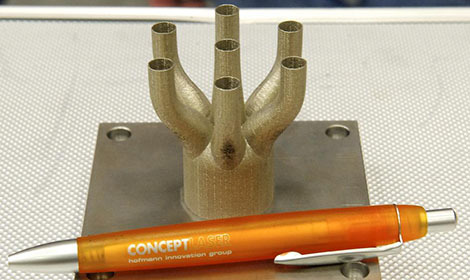 This isn’t the first time 3d printing has been used to make rocket engines. Earlier this year we saw [Rocket Moonlighting] build an entire rocket engine, powered by propane and NO2, using the same technology that NASA is using. [Moonlighting]’s engine is quite small, too small to lift itself off the ground, even. Still, it’s awesome to see 3D printing that will eventually take people into solar orbit. Drones come in many shapes and sizes, but now they can also be 3d printed! To make these drones, the [Decode] group used a selective laser sintering process which is pretty interesting in itself. Once the printing process is done, these little planes are built with only five structural and aerodynamic components. Because of their simplicity, these drones can reportedly be assembled and ready to fly with no tools in only ten minutes! This design was done by the [Engineering and Physical Sciences Research Council] at the University of Southampton in the UK by a group of students. Besides this particular plane, they concentrate their efforts on building autonomous drones under 20 Kilograms. Using a 3D sintering process with this design allowed them to make this plane how they wanted, regardless of the ease of machining the parts.